You know how little ideas get started in your head? Acrylic paint turned out to work best. So, to go backwards for a moment, I teach science. 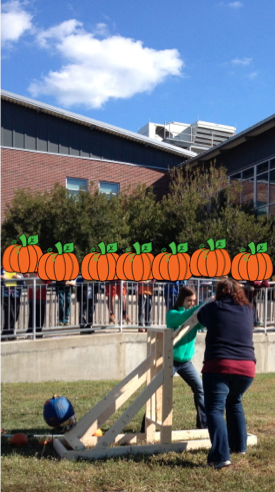 When I found out that our school was going to get the pumpkins, my wheels started turning. Sitting next to my husband one evening, I said, "We should launch pumpkins." Of course, my husband looked at me like I was crazy and I knew the idea was at least half crazy and would probably never get approved. It was at that point that I shared my idea with my colleagues and at least two of my colleagues thought I wasn't crazy. 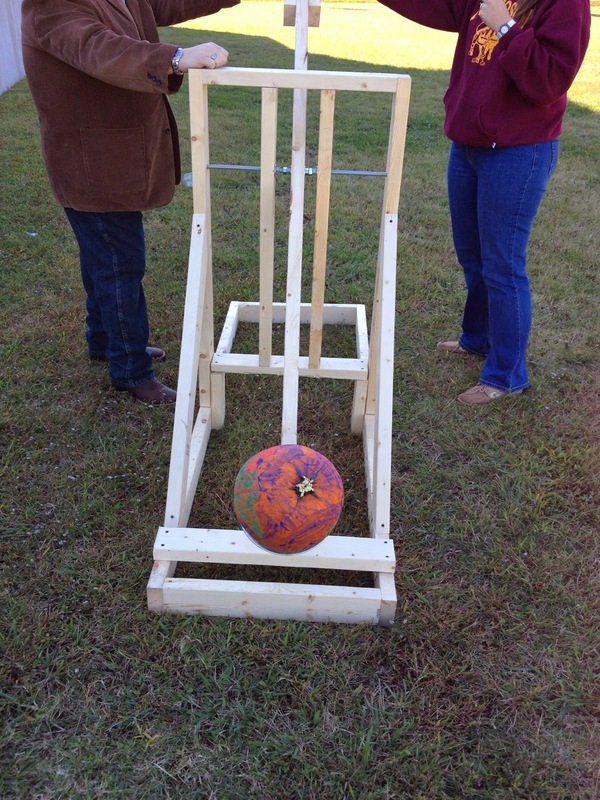 In fact, my one teammate took it as a challenge and asked her husband if he could build a catapult. 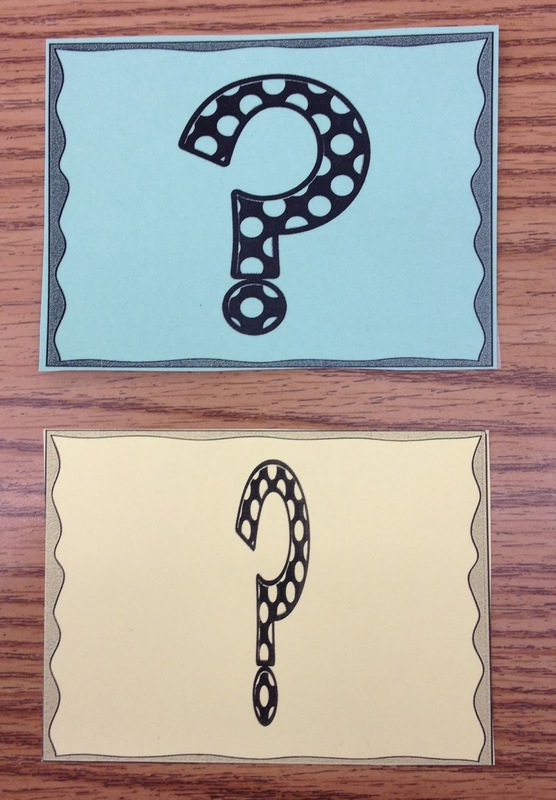 Two of us went to the principal to pitch the idea, pretty much thinking that we were going to be told no. 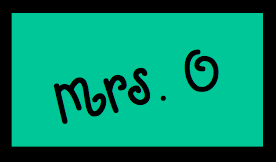 Perhaps it was the idea that we would be taking a geography project and turning it in to a math and science project, but, guess what? Our idea was approved! 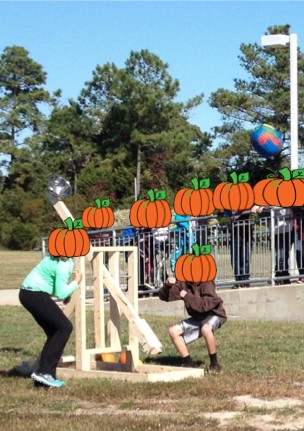 Three weeks later, we were ready for launching! Here's our catapult. 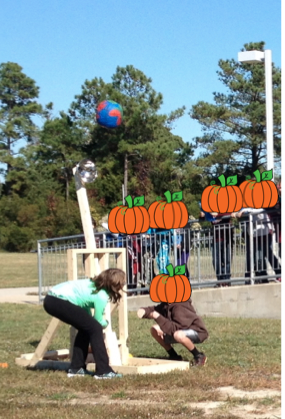 As you can see, we have a colander on one end, and the other end has a handle on each side so that students can each grab one side of the other end, and then use their strength to launch the pumpkin. My teammates did a practice launch in the morning, just to be sure all was well. Back in the classroom, we told the students about this lab, as we had kept it a secret up until that day. As you can see, I bought a few additional pumpkins so that we could compare different sizes and the distances that they would each travel. "No, don't chuck them! They are too young to die!" 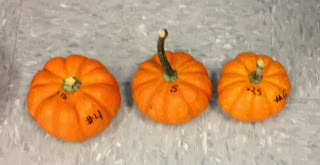 one of my students said about the baby pumpkins. We weighed each pumpkin by having a student stand on a scale and get his weight, then get back on the scale with the pumpkin. Great review of finding the difference! 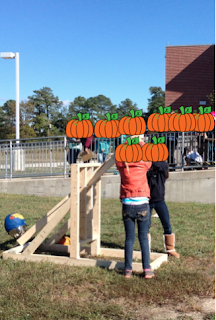 The data sheet that I created had room for data for five pumpkins, so after weighing all of our pumpkins, we chose 5 that were different in weight, and decided that we would use those for our data, but still launch the rest for fun. 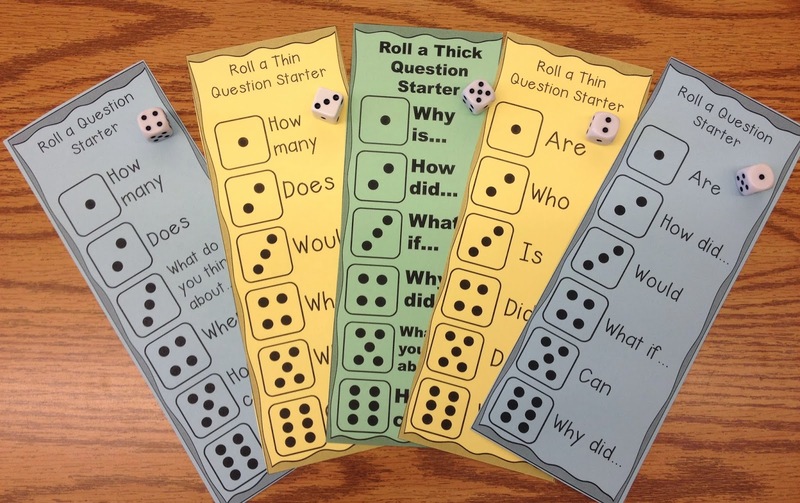 My co-teacher and I decided to give it a try! Laying tarps down made for easy clean-up! We did talk about how our data could not be completely reliable because each group did not necessarily use the same force and we were changing the sizes, which violates the rule of having just one variable per experiment. However, students had great discussions about that alone as they talked about how they could do this lab differently in the future. I was thrilled with this whole lab for so many reasons, but mostly because my amazing team and I worked together to make this happen for our students. I'm blessed to have colleagues who helped to make this happen, and even more blessed that I have a colleague with a handy husband! 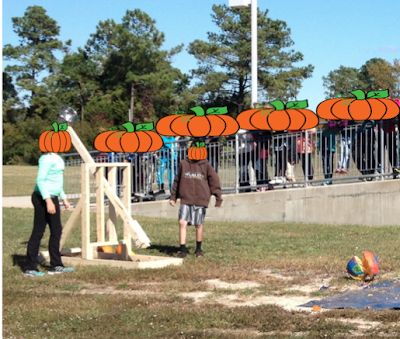 I know that this is an activity that the students will never, ever forget and that a great time was had by all! If you are feeling brave and want to try this in the future, I have placed my 4 page lab on Teachers Pay Teachers at Pumpkin Launching Science & Math Exploration. 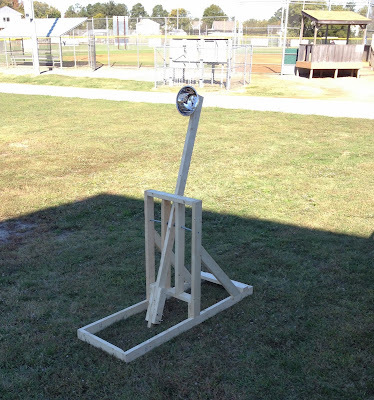 It does not include directions for building the catapult, as that is not even remotely my field of knowledge, but you can google it and find zillions of ideas for creating a catapult that works for you!